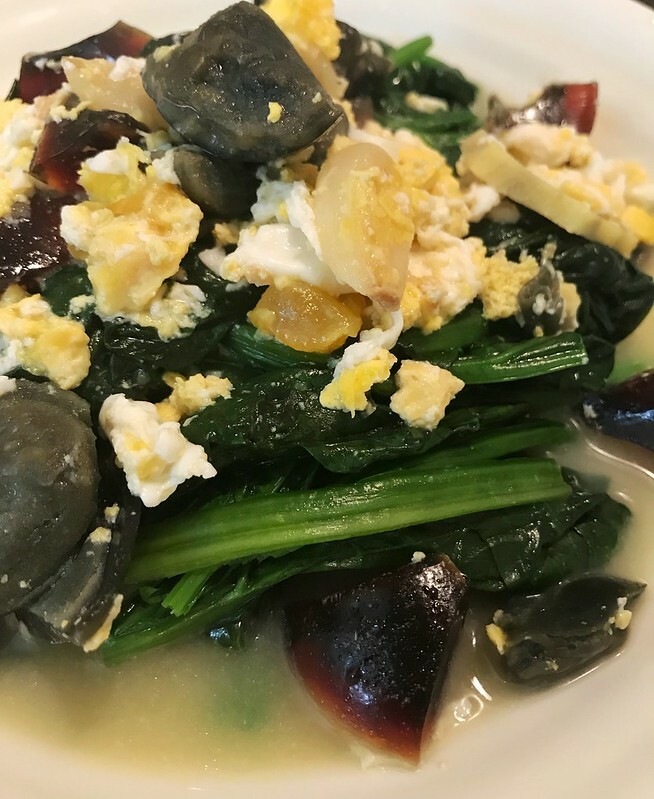 This dish requires two kinds of egg: salted duck egg （咸鸭蛋）and preserved duck egg （松花蛋/皮蛋）. Preserved duck egg is very controversial, since many people just can’t accept the taste & texture of it. When I was very little, I didn’t understand why there would be such black egg on the table. They looked like poisonous and why adults liked them. I couldn’t remember when I first tried it and found it’s not as bad as I thought. And it’s not poisonous, of course. I gradually like it, especially the egg yolk. So yummy. 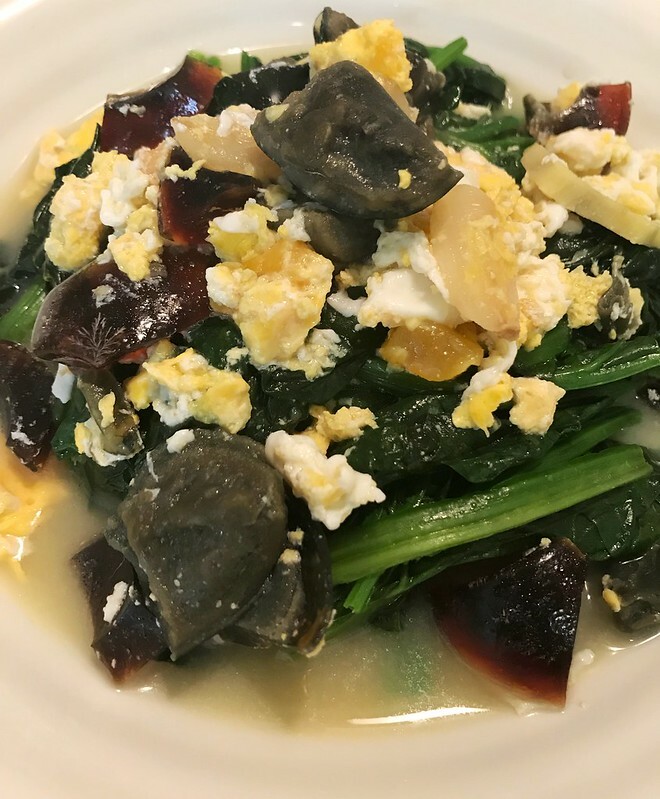 Well, if you have never tried preserved duck egg, you may at least tried it like I did. If you still don’t like, that’s all right. There are so many kinds of eggs out there. You don’t have to like a particular type. 1. Prepare two salty duck eggs and two preserved duck eggs. Separate egg white and yolk for both of them. Then chop the egg white and yolk a bit. 2. Wash the spinach in water. Remove the roots. Can cut into smaller pieces. 3. Heat a pot. Pour in 250 ml stock. If you have your own chicken stock, that will be good. If you don’t have, Swanson is a good choice. Also add in 1/2 cup water and 2 ginger slices. Bring to boil. Then set aside. 4. Heat a pan. Add in 1 tablespoon oil. Fry 5-6 garlic cloves. It needs a bit patience cos you have to fry garlic till golden brown. And don’t burn them. Then take the garlic out. 5. Same pan, same oil. Add in drained spinach. Stir fry a bit. Pour in half of the stock. Cover the pan with lid. Simmer for 30 seconds. Then stir a bit. Lid on for another 30 mins. And take the spinach out into a plate. 6. Wash the pan. Heat on stove. Add in 1 tsp oil. Add in fried garlic, yolk of salty duck eggs and preserved duck egg’s white. Stir fry for 1 mins. 7. Pour in the rest stock. Bring to boil. Pour in salty duck egg’s white. Wait till egg white solidifies. At last add in preserved duck egg’s yolk. Simmer for 1 min. 8. Spinach at the bottom. Pour the egg stock on the top. Preserved egg is also called “100-year egg” (l’oeuf de cent ans).